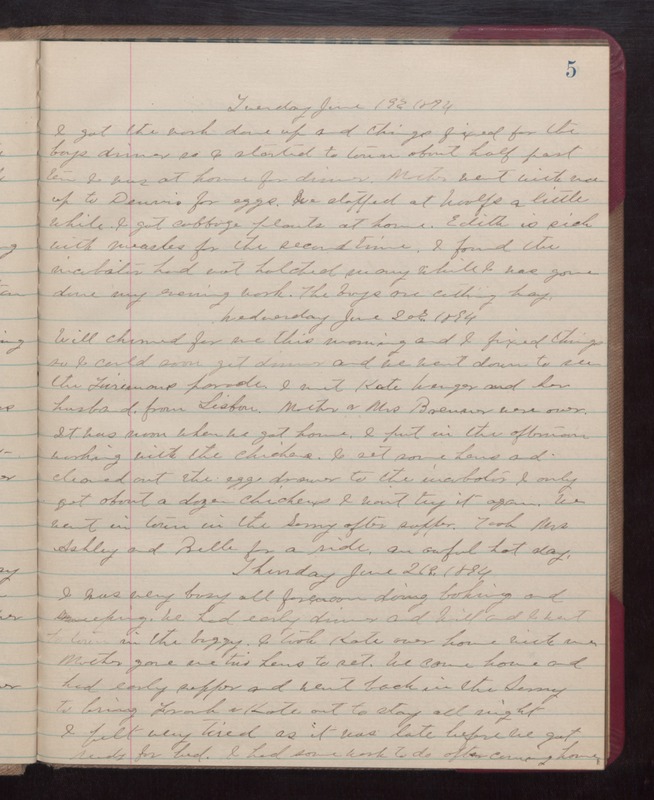 Tuesday June 19th 1894 I got the work done up and things fixed for the boys dinner so I started to town about half past ten I was at home for dinner. Mother went with me up to Dennis for eggs. We stopped at Woolf's a little while. I got cabbage plants at home. Edith is sick with the measles for the second time. I found the incubator had not hatched many while I was gone Done my evening work. The boys are cutting hay. Wednesday June 20th 1894 Will churned for me this morning and I fixed things so I could soon get dinner and we went down to see the Firemans parade. I met Kate Wenger and her husband, from Lisbon. Mother & Mrs Brennan were over. It was noon when we got home. I put in the afternoon working with the chickens. I set some hens and cleaned out the egg drawer to the incubator; I only got about a dozen chickens I won't try it again. We went in town in the Surry after supper. Took Mrs Ashley and Belle for a ride. an awful hot day. Thursday June 21st 1894 I was very busy all forenoon doing baking and sweeping. We had early dinner and Will and I went to town in the buggy. I took Kate over home with me Mother gave me two hens to set. We came home and had early supper and went back in the Surry to bring Frank & Kate out to stay all night I felt very tired as it was late before we got ready for bed. I had some work to do after coming home.